Heat 1 tablespoon of the oil in a large skillet over medium high heat. Add mushrooms, salt and pepper and cook, stirring occasionally, until softened, about 5 minutes. Add tomatoes and garlic and cook another 2 minutes. Stir in kale and 1/4 cup water, cover, reduce heat to medium low and cook until kale begins to wilt, about 2 minutes. Toss well, season with salt and pepper, cover and cook until wilted, about 2 minutes more. Cover and set aside. 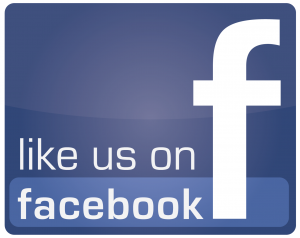 Heat remaining 1 tablespoon oil in a large nonstick or cast iron skillet over medium high heat. Arrange polenta in skillet in a single layer (working in batches, if needed) and cook, flipping once, until golden brown on both sides, 5 to 6 minutes total. Transfer polenta to a paper towel-lined plate as done. 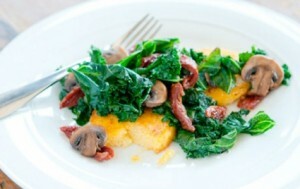 Arrange polenta on plates, spoon kale and mushroom mixture over the top, garnish with cheese and serve.